After 3 years the Sardinian band Holy Martyr come back with this totally new Invincible, I mean totally new in terms of music and lyric concept. What I mean for 'new'??? Don't worry brothers, Holy Martyr is still the pure metal band that you know, but this time the songs are straight, powerful and strong like a punch in your face and the usual themes about Greeks legends and battles this time is not reprised. This time the lyrical concept is about Japan and the legendary samurai!!!! Personally I like a lot this new choice of Holy Martyr and from now this is one my fav album in 2011! 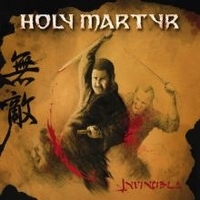 Holy Martyr's Invincible starts with the intro Iwo Jima and the first song, the title track Invincible will show us the new face of this band!!!! Faster than in the past, heavier than in the past, better than in the past!!!!! Lord Of War is simply one of the best tracks of this CD, pure metal without compromises!!! Ghost Dog is a killer mid-tempo tune and next two The Soul Of My Katana (it's an intro for) Shicinin No Samurai are the best business card for this band: speedy, angry, power and an excellent performance!!!! Well done guys!!! Takeda Shingen is another hymn, another perfect piece of this delicious puzzle Invincible!!!! Kagemusha is a return to their old epic style, and also this time they reach their goal whit a central part sung by Labÿrinth's Roberto Tiranti..... Another excellent track with an excellent guest!!! Sekigahara take us back to fast rhythms, another lesson of perfection, another great song..... Zatoichi close this album, or better this PERFECT album!! !